Starting in Barbados, this cruise helps you to forget the cold weather back home! This cruise also has a regional departure from Bristol International Airport. Early Booking Discount of 30% available. 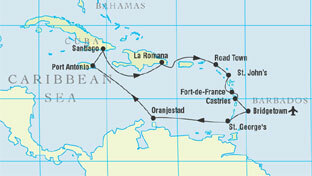 Please note that due to security reasons, we have had to drop our visit to the port of La Romana, and have replaced it with Santo Domingo. Flagship Golf is available on this cruise. Fly/Cruise. View our Fly/Cruises disclaimer here. Did you know we do Anniversary packages?